Today, Nov. 9, the Oregon Fish and Wildlife Commission delisted wolves from protection under the Oregon Endangered Species Act. It was a long meeting before the 4-2 vote to agree with the recommendation of the selected wildlife biologists that the wolf population had met the five criteria for delisting. The biggest factor was that the population had cleared a very low bar — at least 4 breeding wolf pairs for three years in a row. All of the breeding pairs are in NE Oregon near where wolves first entered the state from Idaho. Although there are now one or two wolf packs in the Cascade Mountains of western Oregon, the wolf distribution in the state has a very strong geographic skew. Oregon’s small wolf population lacks the genetic diversity of the restored wolf population in Idaho, Montana, and Wyoming. The wolves of these states came from multiple locations in Alberta, British Columbia and Montana (prior to the reintroduction of 1995-6). The Oregon wolves are based on a handful of migrants from Idaho alone. The wolf population in Oregon retains strong protection according to the Commission. It will not yet become a game population for hunting and the fine for an illegal kill is $6,250 and a year in jail (maximum). The commission today directed staff to suggest an increased fine. It is not clear if there will be any management changes for the delisted population. When there are 7 breeding pairs, changes will be made. Oregon’s wolf population, despite meeting the delisting criteria, has grown slowly compared to the wolf increase in Idaho once they were reintroduced there. Like most other western states, a great deal of wolf habitat exists in Oregon. Tad Larsen and William J. Ripple at Oregon State University determined there was 68,500 km2 of potential wolf habitat in Oregon that could support a population of approximately 1450 wolves. The Commission pondered a partial delisting because of the skewed wolf population, but the state law was thought not to permit it. About 200 people jammed into the hearing room with the wolf conservation groups on one side and the eastern Oregon livestock and related interests on the other. The former said, “This outcome for Oregon’s small wolf population seemed at times to be predetermined.” They pointed out that the delisting has not been considered by independent wolf biologists. The later group said that pro-wolf groups were going back on the delisting agreement they had signed years earlier. Seems like another poor decision by Badly researched science. The Oregon Fish and Wildlife service historically siding with ranchers. The wolves will probably end up being on the trophy hunters end of a “harvest”. They will be targeted and suffer greatly.Good job government agency! Although they have the name Oregon Fish and Wildlife they tend to not be on the side of wildlife. Much too early to be up but just spent the last 10 minutes listening to a wolf howl, up a draw across the way. Hauntingly beautiful sound. Just one howling though, not a chorus. We had a pack of about 5 wolves in the area all summer. They stayed out of trouble but my fear now is members of the pack have been killed, given the heavy elk hunting activity over in that area every year by human hunters. Wolf tags are cheap. The Wolf Patrol site has posted something about hunters grumbling about an outfitter taking 90 elk? Disappointing about OR, but not surprising. Science doesn’t enter into the picture. When does killing hunting season start, in an hour? Wolves can be hunted and/or trapped for *over half the year* in Montana–starting Sept. 5 and going thru March 15. You see a spike in deaths when “big game” season starts and again when trapping starts. As of yesterday, 62 dead so far. compare the following potential wolf population estimates with criteria for delisting – 4 breeding pairs for 3 consecutive years. don’t hold your breath though waiting for that mysterious ‘mainstream hunter community’ to complain about delisting. Larese & Ripple (2006) created a habitat suitability map for wolves in Oregon and found that a maximum of 1450 wolves could occupy Oregon. This value increased to 2200wolves if industrial timberland in western OR was classified as suitable wolf habitat. Fuller et al. (2003) – using an estimated elk population of 128K elk distributed across 151K km2 of summer range habitat – estimated a total of wolf population of 1780 wolves within 151K km2 of summer range elk habitat. Carbone & Gittleman (2002) estimated a max wolf population at 1722 wolves. If conservative density-threshold is used then OR provides habitat for 1500 wolves. Thank you. I will add Carbone & Gittleman to the story. I knew the figure was well over 1000, but could not find the source. Mareks, OR elk population is around 50K. both Roosevelt and rocky mt. I would be interested in knowing where they come up with 128K population figure ? We can only hold our breath and hope Oregon keeps its promise to provide “strong protection.” and I don’t understand why timber lands woldn’t be considered suitable habitat. I’d feel much more comfortable with the delisting when somebody who is identified for an illegal kill to be fully prosecuted, with no McKittrick excuse allowed. If it’s Oregon’s decision for a future wolf “big game” hunting season, then those who have agreed to the delisting process must also be held accountable. Oregon appears to have its act together, with the usual suspects at either extreme. I’d feel much more comfortable with the delisting when somebody who is identified for an illegal kill to be fully prosecuted, with no McKittrick excuse allowed. With all due respect, Dr. Mech, in an email submission for the ODFW Commission’s public record, does not have a problem with genetic diversity in the OR wolf population. He couches this comment in the context of a larger functioning metapopulation in the adjacent states. He apparently supports the delisting, as well and concluded the 5 criteria of the Oregon Wolf Plan had been met, therefore paving the way. I personally believe it is a bit early to delist based on numbers alone. But it seems the genetic diversity issue is a bit of a red herring, which of course, if determined to be a problem can always be fixed by dropping some new genetic material into the mix with translocation. This, of course, is a cornerstone of the WA wolf management plan. I haven’t reread the Washington State wolf management plan but it was my understanding the plan did not include translocation of wolves and that they would have to disperse on their own. In my comments a couple of years ago I specifically noted that it would be unlikely the wolves would be able to negotiate 6 or more lanes of I-5 and the heavily populated urban areas to successfully make their way to the Olympic Peninsula and Olympic NP. As you know the Park is extensive and surrounded by national forest lands including several wilderness areas. I know the wolves are creative but unless they learn to fly or stowaway on a ferry it is unlikely they will make it there on their own without some human assistance such as translocation. There are of course special interests that oppose wolves on the Olympic Peninsula and I assumed that was why translocation was not considered an option. Your understanding of the WA Wolf Management Plan is incorrect. Translocation IS a part of plan implementation, and was discussed extensively because of the discontinuous habitat/roads/water, etc. The reasons for translocation are clearly stated. See pp. 69-70, and the referenced Appendix I. Translocation efforts, however, will be subject to state SEPA/NEPA review. [notations within parentheses are mine -WM]. You are correct about how a lack of genetic diversity could be corrected with simple translocation of one or more new wolves. The same would be true for other populations of large mammals that have been reduced to a low diversity, assuming that there are animals available outside of the depleted population. In today’s political environment, however, even small practical steps are usually defeated by ideological conflict. One other thing, I didn’t mean to say that the diversity of the Oregon wolf population is too low. I meant that it is considerably lower than the wolves of Idaho, Montana and Wyoming. These have high genetic diversity. While wolves will continue to be protected by the Plan, the Plan could be changed during the review process. 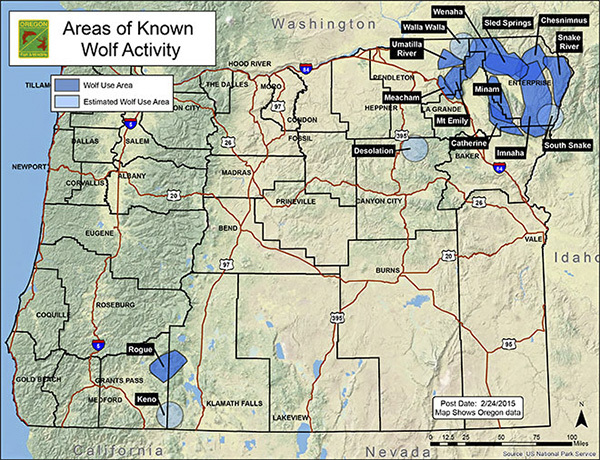 wolves located within the state. The number of breeding pairs and their distribution within Oregon must be sufficient to stand alone in determining whether the delisting criteria are met. However, researchers have noted that the establishment of new populations and maintenance of populations that are heavily controlled or harvested rely extensively on a source population of wolves (Fuller et al. 2003). Several notable examples of small wolf populations can be found in the scientific literature. The Isle Royale wolf population began from a single pair of wolves in about 1949. The population has fluctuated between 12-90 individuals.23 This population has persisted for more than 50 years despite being isolated on an island and apparently losing 50 percent of their original genetic diversity. Remnant wolf populations in Europe (i.e., Italy, Spain and Portugal) numbering fewer than 100-200 wolves persisted for decades and have since expanded their numbers and range, and avoided extinction (USFWS 1994). You will want to also look at the preceding sentences of the same paragraph from which you took your quote. It refers to the gene flow from the larger population (the point of my comment). I’m sure you know this. And, it is entirely consistent with Dr. Mech’s conclusions AND the OR wolf plan. From past discussions, I know how you love to take things out of context to make some kind of inane point, sometimes untrue. you love to take things out of context to make some kind of inane point, sometimes untrue. I don’t think I could be more disappointed. My confidence in wildlife “management” agencies has always been low, but it has now taken a true nosedive. What kind of insanity is it that allows people to make these decisions whose profession is to kill and to advocate for killing? Dr. Mech is right of course, in an ideal sense, but nobody seems to want to acknowledge the ‘wild card’ of the wolf hunters and those who want to be rid of them. And they are of course an extension of the GRM and Canada wolves. But if some are killed, and then ‘drop’ some more in, what could be more callous? Why not leave them alone, and continue to address depredations and problems as the occur? Study after study has shown that general hunting does not stop depredation, is that not correct? Again, I’d feel a lot less leery if there were not loopholes such as McKittrick to protect poaching and deliberate killing. The following is a letter recently submitted to Representative Greg Walden in a coordinated effort by multiple western state conservation and sportsmen groups to urge congress to federally delist the wolf statewide in several western states (including Oregon). I read a few of the articles on that web site. It taught me that the ungulates are being decimated by wolves, which was rather astonishing given the estimated population size, and small range. There appears to be confusion about ungulate population goals too: If a commission declares a goal of X thousand of a herbivorous species, this then defines the healthy level in the minds of some. Just maybe that’s true in OR, but if so it’s the only place I know of. Perhaps “targets” are more like maximum tolerable densities, with knowledge that most years have imperfect weather, and in bad times the population may only be half that – which when that occurs brings much complaining from hunters (now true in many states). Deer at target densities where I hunt in northern lower MI means young white cedar do not exist unless fenced, and that is merely one sign of the degradation, but because it is possible have that many deer for a very long time, it can be call “sustainable” in a very narrow sense (the deer numbers are sustained). Hunters compare to years of much higher ungulate harvest a while back, golden days in their memories. I mostly recall insane densities and near unbelievable winter-kills. Not to mention road kill. Heard from two hunters in the past week that they “sure as hell” hoped that the over 400 elk, taking a rest, on a private ranch, just across the valley from me, would be run out of there AND soon. Been in the same spot for 20 years and realized over the years that healthy populations of elk migrate in, come spring and migrate out, come fall. Most spending their time in the forests and highland meadows, on public lands. They seldom linger come fall on ranchland unless their babies (who haven’t been shot) get stopped and are unable to navigate the many ranch fences, lining their migration route, out of the valley. Subsistence hunting has certainly been a way of life for many of the locals in my area and surrounding areas but the mentality/need? seems to have shifted a bit over the years, especially when it comes to out of state or even out of area, hunters. Begs the question – are those in charge of management areas(FWP?) just dolling out hunting tags, year after year, with little thought to how elk (and deer) are impacting some areas and not others? It is complicated Nancy, it is complicated, no one knows how to handle vast herds of elk on private lands that do not allow any hunting access. I will be over in your neck of the woods in 2 weeks. I have reservations at the Stockyard Inn in Dell, Mt and have 2 elk tags. The elk have moved out of Big and Little Sheep Creek and are living in the irrigation pivots with the bigger bulls up the mountain side coming down after dark and leaving before light. Elk, I honestly don’t think we are talking about “vast” herds of ungulates, anymore, anywhere out here in the west and why natural predators have become such a threat? I know the wolf situation well in Oregon- For one it can’t maintain the numbers as stated by Larsen and Ripple of a maximum of 1450 wolves in Oregon. Completely inncorrect! I have emailed these two many times chanllenging this notion and have never heard back from them. There is not the game density in many areas and the human disturbance is too great. Maybe in an Oregon, without people, this would be accurate. The other issue at hand is the social issue of working through the acceptance of wolves and sticking to a plan that all parties agreed to. In Oregon the plan is being followed and it should be followed to see if we have a successful outcome or not. Wolves are here to stay and we may have a good plan to adhere to with the return of the wolf, but we will not know if we don’t stick to the Oregon Wolf Management Plan. All indications are wolves will continue increase in numbers and expand accross the state. I am completely pro-wolf and I support the Oregon Wolf Management Plan. In the tiny settlement of Imnaha along the Imnaha River one can get a good feeling for the local hatred of wolves simply by walking into the town’s sole tiny bar. There you will see a sign on the wall with the figure of a wolf with a circle around it – with a line drawn through it – saying ‘no Canadian wolves’. The Imnaha River area was wintering grounds for Chief Joseph’s band. Yes- I spend a lot of time in NE Oregon and it is very difficult to see some of the extreme attitudes that I don’t agree with. My hope is over time the extreme thoughts on both side of the wolf issue will decline and following the Oregon Wolf Management Plan, I believe, is a step in that direction. I agree with WM that it’s too early to delist, but I’m fairly certain that conservation groups had extensive input into the development of the Oregon Wolf Plan. They also have to date a good working relation with ODFW regarding wolves so I’m optimistic that wolves will continue to disperse to more areas of Oregon such as the Cascade and maybe even Siskiyou Mountains. After all, they are extremely good at reproducing and dispersing. Maybe if we quit fighting over whether wolves are listed or not and instead let them be wolves, while protecting sources of income and ways of life, everyone will win. Thanks. Delisting need not imply slaughter, at least in theory – and just cause it seems that it does in practice in some places does not mean it’s true everywhere. I have hopes for WA, OR, and great lakes states – we simply have more druids and bunny-huggers. When the time comes that you’ve got a pretty good population that’s not in trouble, letting the state manage seems reasonable to me. Yes there’s some risk, but there’s possibilities. The question can then become which states are doing the best job. The wolf lovers are quite a few, more than the hunters, but perhaps not more than the people who have financial benefit from hunters and think (rightly or wrongly) that a few less wolves means a bit more money, of which I am not very convinced. It used to be a hot issue in MI when we had any say, and I wanted to see how that would turn out, and still do. Wolves, bears, and other cool animals in “God’s country” excite the kind of tourists I want to come here, and me as well. Ungulate, shmungulate – those are common as dirt by comparison. How I wish that wolves and other wildlife could live, die and recolonize without OCD human interference. I sincerely fear for the welfare of OR-7, that he will meet a fate like Echo and a long list of others by someone using the McKittrick excuse. Why do we allow this? I know I’ll hear it from those who think ‘a wolf is a wolf is a wolf and all are up for grabs’ contingent – blah, blah. Eastern Oregon has maintained four breeding pairs of wolves, meeting the criteria for delisting in that part of the state, and congressional action has removed wolves in the east from the federal Endangered Species List, but the animal remains on the federal endangered list in Western Oregon. Meanwhile, the northern spotted owl, the subject of much controversy for its role in restricting logging in the owl’s old-growth forest habitat, remains listed as threatened. And yet there are an estimated 1,200 pairs of spotted owls in Oregon alone. The known gray wolf population stands at 81 individuals, most of those in the northeastern part of the state. Phase II was completed less than a year ago, and Phase III is not yet complete, but the commission chose to delist the wolf anyway. Wildlife advocates had urged the commission to reduce the listing from endangered to threatened, but the vote delisted the wolf entirely. I wonder if this can be challenged in court. Anyone care to take a guess at how many wolves will be in the official count for OR, which will be done in December 2015? Counts typically involve actual sight documentation by the biologists doing the survey. And, the OR 2014 count was 81, with 9 breeding pairs. This was a 26 percent population net increase from 2013 (81/64 = 1.265). So, will the net (base population + births – deaths +/- in and out migration) December 2015 number (including surviving pups as they always do) be in the neighborhood of 100+ (with an unofficial projection somewhere around 115-120? And, how many breeding pairs, maybe as many as 10 to 14? I am very curious, since ODFW staff pushed this delisting pretty quickly. I am wondering if they know more than they are apparently disclosing at this time. Any educated speculation out there? You may be onto something. I keep looking at the pack map and am wondering about who has been roaming those 400 miles between I-84 and the Rogue/Keno pack(s). There’s enough wolves in the South Cascades to have already begun colonizing California, so it seems possible that there may be more individuals/pairs/packs on the margins of those already known publicly. Perhaps delisting the wolf was proactive in anticipation to responses from AG or hunters to the winter count. Agree. Somewhere between 100 and 120. That is about one wolf for every 985 square miles in the state; or about 1/1000 of a wolf per square mile, depending on how one looks at it. I don’t think ones chances of seeing a wolf on an afternoons drive is very likely. I see deer daily from my kitchen window. I suppose its all about priorities – cows & ungulates seem to warrant far more attention, concern & protection. increased rates of legal mortality, while holding illegal mortality at baseline values, had a negative effect on population growth rates and mean, maximum population size of wolves. With a starting population of 85 wolves and at a legal mortality rate of 0.20, wolf population declined. This suggested this rate of legal mortality was not sustainable over the long-term at least at a starting population of 85 wolves and additional illegal mortality of 0.05. You are at it again – taking things out of context and then extrapolating on them. I bet it confuses a lot of folks. The assumptions of the ODFW stochastic modeling effort (adapting the professor Joe Bull model from Copenhagen) were admittedly conservative on nearly every variable. And, importantly, ODFW did a sensitivity analysis on some of those variables to see just how it affected results over a 50 year projected time horizon. Of course if there is lethal take off at a certain rate it negatively affects population growth….duh! But – and this is important Mareks – it is a model conclusion based on a variable applied constantly over the planning horizon. Again….duh! And, as you note, yes, ODFW did start with a base population of 85 wolves (instead of 81 the official 2014 count) for a 2015 baseline for its modeling exercises. That illustrates my point. The reason for this, was that they actually UNDERCOUNTED as there were 85 wolves before the April 2015 pup crop. Probably lots more that were undercounted and really out there on the ground. That number probably approaches 100, if Dr. Mech and his up to 20% rule are reliable indicators of under-estimating population. Gotta wonder what the result would have been say if they started with 100 for the modeling? So, let’s just admit there was a KNOWN undercount by at least 5 percent. That, according to their report also included, importantly, 16 packs plus a couple individual wolves were counted rather than the 9 reported in the 2014 figures! That is important…actually that is HUGE. And all of this goes to the very point I was trying to make. 2) dropping your usual refrain / utterance about the undercount within 20% range. well, I pointed out that “biologists assume 3 wolves would immigrate annually from surrounding populations” – so much for that mighty ‘Idaho connection’. in 15 years OR wolf population has grown to 81 individuals (Dec 2014). That’s not very impressive growth rate – therefore you are hiding behind Mech’s authority to justify your stand that it’s ok for wolves in Lower 48 to be managed as close to legal thresholds as possible (100-150 wolves / 10-15 breeding pairs for ID, MT). Why? Because otherwise wolves are silencing elk bulls in their prime and your elk hunting’s success rate is hurt. and what exactly was I ‘extrapolating’? Don’t use fancy words inappropriately, lawyer. Of course, in the Science Review section they discussed modelling and used conservative estimates. But why? just for fun and to engage in intellectual exercises just for it’s own sake? No, the purpose is to help to set guidelines for wolf management. In 7-8 years OR wolf population has grown to 81 individuals (Dec 2014). 15 years as you stated is incorrect. The first confirmed pack was in 2008. What does this mean??? Are you saying wolves silence elk and hunting success rate is hurt? Elk rifle season in Oregon, when most elk are killed, has nothing to do with elk bugling. I bow hunt with the Imhaha Wolf Pack during the elk rut and the bull elk are still bugling. Temperature is the biggest factor with elk bugling the colder the more bulls bugle. I am pro-wolf and think it is important to share factual information. the first documented wolf dispersed to OR in 1999, that’s all I was refering to. Yes, from biological point of view, meaningful is only a breeding pair, not a lone individual animal. I am the source of the assertion to which Mareks refers. It has been my experience in hunting elk that there is less bugling (and cow/calf talk) in the presence of wolves. I do agree with you that temperature is a big factor in vocalization, at least for bulls in the rut. I certainly can’t speak to where you hunt in the presence of wolves, but I can speak to the area I hunt in N. Central ID, and have hunted here for 25 years. Wolves showed up in large numbers about 8-10 years ago. Elk behavior changed significantly – elk going to higher elevations, steeper ground and more dense cover. It is a different kind of ground than the mostly rolling hills of the lower parts of the Wallowas. There are studies on this involving predator avoidance behavior, which seems to confirm anecdotal observations ( http://www.pnas.org/content/106/30/12388.full ). I don’t know that anyone has studied specifically the reduced bugling or cow talk, but it seems logically consistent with the other behavioral changes (make elk noises = I’ll tell you where I am and you can come chase/eat me). And, a number of hunters, even biologists, I know will confirm or at least not disagree our observations over this time period. As for the Imnaha pack, seems to me they don’t bother elk as much as they do cows (quite a few confirmed cow/calf kills and how many more probable kills/injuries? …and the occasional mule). One has to wonder just how fast the OR wolf population would have grown without the removal of so many problem wolves. I don’t think there is much worry about rate of population growth, because the population continues to grow even in light of removals (both legal by WS/ODFW and the slimeball 3S crowd). don’t you want to re-read that Dan MacNulty’s article again? what’s wolf’s energy budget – 12…23 elk per 6 months?? Let me be candid here. You’re an idiot. The reference was to all elk – they talk to each other, not just VERY large sexually mature bulls. Calves talk; cows in estrus talk; elk talk to locate and find each other; bulls bugle to other bulls, including maturing satellite bulls or mature challengers. And, sometimes elk talk to each other to give a warning- ever hear a cow bark? A little tutorial for you sport, and do pay attention. Elk are among the noisiest ungulates, communicating danger quickly and identifying each other by sound. •High-pitched squeal: Newborn to its mother, who recognizes her calf by its voice. •Chirps, mews and miscellaneous squeals: General conversation among the group. •Bugling (bellow escalating to squealing whistle ending with grunt): Bull advertising his fitness to cows, warning other bulls to stay away, or announcing his readiness to fight. •Elk also use body language. For example, an elk displays dominance by raising its head high. Thanks for the update you two. My experience is that once the elk get used to the wolves it does not impact their vocalization as much. I bow hunt on the edge of and in the Wilderness, so the elk have always been up high 6000ft to 9000ft and most of the Imnaha Unit is very steep with deep ravines. The amount of hunters and their skill level seems to dictate how elusive the elk are in the area I bow hunt- not the wolves. At the same time I hear other hunters swear elk used to be easier to hunt before the wolves, so there is probably something to that. I also think the much warmer falls during the last 10 years of Oregon’s bow hunting season is having a major affect on elk behavior during the rut. As far as elk or cows goes the Imnaha pack really does not kill that many cows considering the amount of cows in the vicinity of wolves, but when they are out there on national forest land the cows are at the mercy of the wolves. One old mule in the middle of winter was a confirmed wolf kill seveal years ago, so I consider this a extreme case. This fall a bull elk killed a horse in the unit I bow hunt. I spend time in the area I bow hunt through-out the year and I hear a lot of vocalizition from elk all year long expecially during the calving season. I suppose they might change some vocalization around wolves and I am sure the number of wolves in an area has an impact on that too. “In March 2015, state officials announced they had killed 19 wolves in northern Idaho to help increase the elk population there. The number of elk had dropped from 16 000 to roughly 1000 over the last 25 years. One old mule in the middle of winter was a confirmed wolf kill seveal years ago, so I consider this a extreme case. This fall a bull elk killed a horse in the unit I bow hunt. I wonder if CA could have any input/influence, as killing OR’s wolves could harm and disrupt recolonization and packs that migrate and live in their state? OR does not own them. The Rocky Mountain state all band together as wolf hating states. California isn’t a wolf hating state. Research published in 2003 suggested that the smallest viable wolf populations might be two to three adjacent packs with four wolves each, located 40-60 kilometers apart (Fuller et al. 2003). Each pack might cover 117 square kilometers if the ungulate density averaged eight deer per square kilometer. Vila & Wayne’s study suggested the historical wolf population in the Western US and Mexico may have been about 380K animals before they were exterminated. If only the knowledge about genetics [that as few as 1-2 immigrants per generation (~5 years) can be sufficient to minimize effects of inbreeding on wolf populations] had been known in the 19th century! jeez, livestock industry would litter those biologists with grant money and hunters could scientifically justify the wolf extirpation campaign. Similarly, ‘mainstream hunters’ (like WM, Elk 375 etc and their hunter organizations) love genetic diversity criteria & legal thresholds for states. That’s what they call “co-existence with wolves”. Therefore they are no good for wolves and there will be no common ground between them and wolf advocates. Jeff E and Rork are a different story – they can get their venison without supporting unnecessary wolf killing and can object to anti-wolf nonsense publicly. The problem is neither Jeff E nor Rork is a ‘mainstream hunter’ – they are on the fringes and hunters like they are few in number. Bottom line: show me more jeff es & rorks and less wms. Thank you. Conservation groups are considering suing the department over the science it used to recommend the delisting. According to the Wolf Management Plan, the agency’s report is supposed to be peer-reviewed by outside wildlife scientists—something the department didn’t do until after the Oct. 30 deadline. What BS. How many do they think are out there? Just more propaganda. The only ones pushing for this are ranchers, so that should say something to everyone. But of course, it won’t. I hope the ODFW are sued. Give Oregon DFW a chance to see if they can make the wolf plan work. The wolf population is increasing in numbers and area inhabited. There have been no wolves killed for predation since the rules were adopted. -10 because we’ve heard it all before – we’ve ‘waited for the plans to work’ with Idaho, Montana, Wyoming, Michigan, Minnesota, Wisconsin, and now Oregon, and we have not been surprised. Isn’t that the definition of insanity? Repeating the same thing over and over again and expecting different results? With Oregon, the recovery number is so small as to be ludicrous. The Oregon wolf Management Plan and the state of Oregon are very different, so you should not compare them to other states. I would also add that wolf recovery in those other states has been pretty successful even with poor plans. The only reason wolves are in Oregon is because wolves came over from Idaho! And from thence into California to form the Shasta Pack. I do not agree with their decision because with just 80+ wolves that isn’t enough to say whether the population will endure or not. Left alone, the wolves would have migrated anyway, and to more places! It’s not due to any human management *eyeroll* plans, but more that wolf advocates have interfered with those who would destroy them. As it is, it’s a stalemate at best. You cannot trust the anti’s not to make up reasons to kill them. Again, left alone, they’d have migrated on their own anyway, and to more places. I keep returning to the bone pile of that number, if only to howl at those who find victory in it. My apologies if this has been posted already, but it really captures the tone of this crazy obsession this country has with killing wolves. The cattlemen in OR and in all of the wolf states are far too involved for anyone who values our native wildlife to have any confidence in any ‘management’ plans at all. I implore our wildlife groups to challenge this in court. This one, with only 81 wolves needed to trigger the delisting (pun intended) is so over the top as to be insulting, and a throwback to the 1800s. I would say OR is the worst attempt yet. But 81 wolves, and state biologists are partying like it’s 1999, when a lonely gray male padded over from Idaho, the first wolf seen in Oregon in 50 years. I’d say the state biologists and their liege lords, the cattlemen, are partying like it’s 1899! Do you live in Oregon? Have you traveled the state and do you know the geographic make up of the state? Have you spent time in Oregon where wolves live? I think these are important questions for you to ask yourself before having such a strong opinion. Until any of us can actually say we have done these things we really are limited in how informed our opinions are. I also want to make it clear that I am pro-wolf to the core and if I had my way the management of our public lands would be only about improving the environment and wildlife habitat, but it is not just about my way. The Oregon Live article is a joke. Wolves in Oregon are still protected, so there is not going to be any mass killing of wolves. There is going to have to be a balanced approach with all parties involved. Frankly, I am sick of all these extreme attitudes on both sides of the wolf issue. I can answer the above questions I posed with a yes and will be more than happy to inform anyone about the true facts regarding wolves in Oregon. I live in western Oregon, was a supporter for the reintroduction of wolves into YNP and Frank Church Wilderness, and was pleased to see wolves cross the Snake River into Oregon. I also attended a meeting in Salem, 2005, that gathered information used in the formulation of the Oregon Wolf Plan. Will be interesting to see how Oregon handles this and if “McKittrick” comes into play. This happened even sooner than I thought it would! This is why delisting is a very, very irresponsible step to take. ODFW is trying very hard to look like they are serious, but I agree, let’s see what kind of charge this man actually receives. The collar is kind of hard to miss, isn’t it. This happened prior to the delisting. McKittrick is a DOJ policy applied, some say incorrectly, to thwart federal ESA prosecutions. I understand there is a pending suit on this issue in NM, because the policy does not track the ESA law). Importantly, wolves are no longer federally delisted in Eastern OR as a result of the USFWS rule that was made federal law in that evil Congressional “rider” bill that delisted wolves in ID, MT, and the Eastern 1/3 of WA and OR (as well as a tiny part of UT). This guy would be prosecuted under the OR state ESA and other applicable game laws. A McKittrick type analysis would depend on whether the state wildlife statutes recognized a defense of “I thought it was a coyote” as applied to those laws (sorry I don’t have the time to look them up). Just thinking out loud here, but wouldn’t be one bit surprised if a successful prosecution resulted in a pretty stiff slap penalty, especially in this contentious regulatory environment. And, I do think he will be prosecuted. It will be interesting to see if any wolves make it into the Coast Range west of I-5. In 10 years there should be 300 or more wolves in Oregon, hopefully more will end up in the Cascades. Eventually they will open a hunting season on them like in Idaho. Maybe the state will allow hunting them soon in the NE part of the state. Either way, it will be good to eventually hear of wolves up and down the Cascades and Coast Range from Washington state down to California. We also continue to attach a lot of human nonsense to wolves — our own longing for connection to something wild, our resentment of government interference, anger over unwanted competition for game, blaming the animals for hard times. That’s an awful lot for an animal to carry. HCN: Where’s The Middle Ground on Wolves? I had read that this recent case of ‘mistaken identity’ where a wolf was shot in OR was before the delisting, or very close to the time of delisting. That makes it even worse, IMO, that these wolves can lose full protections when there is still so much active hostility towards them. Appealing to mankind’s (mythic? )higher nature (sticking our heads in the sand)is an approach that isn’t going to work. See sage grouse developments for proof. On Nov. 24, George Wuerthner had an article, “Delisting wolves was a mistake (opinion)” in the Oregonian.